The 1816 American edition of Emma was the only Austen novel to appear in an American edition during her lifetime (1775-1817). 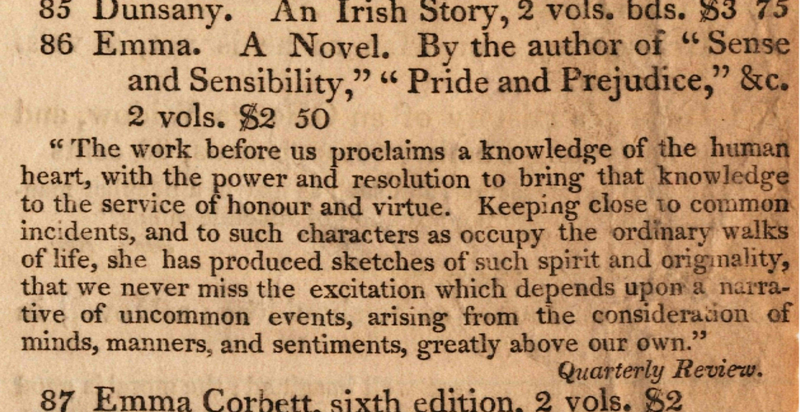 The favorable review of Emma by British author Walter Scott in the Quarterly Review seems to have caught the eye of Philadelphia publisher Mathew Carey (1760-1839). Aside from this apparent impetus, little is known about why and how Carey decided to publish his own American edition of Emma. Portrait of Matthew Carey by John Neagle, 1825, courtesy of The Library Company of Philadelphia www.librarycompany.org. 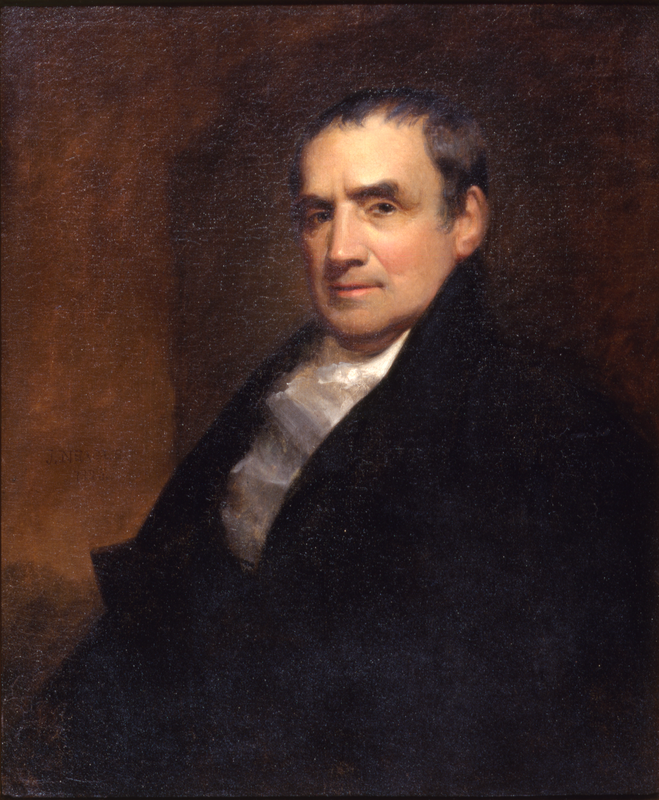 A native of Ireland, Carey emigrated to the United States in the 1784 and subsequently established himself as one of the most ambitious, successful publishers in the young American republic. Like other booksellers of the time, he sold expensive imported books as well as titles reprinted in America, which were generally both produced and sold more cheaply. Indeed, Carey advertised copies of the London edition of Emma, priced at $4.00, as well as his own edition, at the cost of $2.50 already bound or $2.00 in boards (a less durable form of binding). Excerpt from Matthew Carey’s Catalogue of Novels and Romances, 1817, advertising Emma with a quote from Walter Scott’s 1815 unsigned review. Like John Murray’s original London Emma, Carey’s Emma is dated 1816 on its title page. The printing of Carey’s Emma was not completed until December 1816—one year after Murray’s London Emma was printed (December 1815). The print run of the Philadelphia Emma was 500 copies, a typical quantity for a novel issued by him. Aside from typographical errors made by the printer in the Philadelphia Emma, the most significant difference between the 1816 London and Philadelphia Emmas lies in their formatting. To save money, Carey compressed the text of the novel into two volumes, rather than the three of the English edition. Another cost-saving strategy of Carey’s was to use a less expensive grade of paper than Murray did. The combination of cheap paper and tight binding, however, is likely responsible for how few copies survive, as well as the damaged condition of several. The Philadelphia Emma was only belatedly recognized by bibliographers, in part because of the extreme rarity of surviving copies. Geoffrey Keynes’ 1929 Bibliography of Jane Austen lists the 1832-33 publication of all six novels by Carey & Lea of Philadelphia as the first American editions of Austen. David Gilson’s Bibliography of Jane Austen (1982; rev. 1997) does include the Philadelphia Emma, with descriptions of the three copies—one of them Goucher’s—known to him at the time. Three more have since been verified. Even today, the Philadelphia Emma is often unknown to those who are familiar with Austen’s works. Gilson, David. “Jane Austen’s Emma in America: Notes on the Text of the First and Second American Editions.” The Review of English Studies, New Series, Vol. 53, No. 212. Oxford University Press, 2002.